Is lodging included in the registration cost? No. Lodging is on your own. You can choose to stay on campus at Calvin College which can be selected and paid for during your online registration process. Or, if you want to grab a group of gals and stay at a local hotel, enjoy your slumber party (just don’t stay up too late and miss your morning sessions!). View the list of local lodging options here. For those who wish to stay with family and friends in town, you are welcome to choose this option as well. How can I help my team organize our registration? Check out this worksheet which is a checklist of the information needed for the registration process. Have each of your counselors fill out a worksheet so that whomever registers you can quickly complete the registration process. Yeah team! Yes, if you need an airport shuttle please visit the Travel & Lodging page to confirm your airline, flight, and travel information. Costs will be $10.00 each way. Are all meals included with my registration cost? No. Only breakfast, lunch, and dinner meals on Saturday as well as Sunday breakfast are included with your registration fee. If you wish to eat on campus on Friday, those meals need to be purchased additionally during the online registration process. While GEMS loves children, the Conference is intended for adults only. To provide a conducive environment for learning we ask that babies not attend workshops or main sessions. Many people with babies come with a caregiver who tends to the child while the mom attends sessions. If you wish to discuss caregiver options, please contact Alecia Van Hulzen at alecia@gemsgc.org. What time does Conference start? Conference officially starts on Friday, July 26 at 7:00pm with the opening worship/main session. If you desire, you may attend the optional pre-conference sessions on Friday as well as dinner on Friday evening. These options need to be pre-purchased during the online registration process. Why are there options for meals, workshops, and lodging at additional costs? We want you to be able to customize your Conference experience as you desire! If you are able to come early and attend pre-conference sessions – great! If you have to work all day, it’s just fine to join us for the opening of Conference at 7:00pm. If you want to eat pre-conference meals off campus – go for it! Or, if you want to sleep at a family or friend’s home in town, you are welcome to do so. We encourage you to make the most of the Conference experience that works for your budget/schedule. If I stay on campus what is provided in my guest room? Great question! Each guest room has two twin beds and shares a bathroom with another room. Towels, washcloth, a bar of soap, and a hand towel are provided. Sheets, a blanket, and a pillowcase with pillow are also provided. All rooms will also be provided with a fan. Can I pay extra for my own room? Yes, during the online registration process you can select your own, single room and bathroom for $60.00/night. You will not share a bathroom or adjoining bedroom with anyone else. You can also select the option to have your own room, but share a bathroom. This option is available for $45 USD/night. There are so many amazing workshops! Are you audio or video recording any of the sessions? Yes! We will be recording some sessions for inclusion in the ReFresh Training site. Are there local tours offered to explore the area? Check out Explore the Area. There are many local attractions we encourage you to explore on your own, with a group of women, or with your team. What resources will be available for us at the Conference? LOTS! In addition to all the encouragement offered in the keynote and workshops, you can visit the Conference Store to see all the GEMS curriculum and products. In addition, many sponsors and vendors will be available with resources which may be helpful for you in club or within your homes. I’d like to see Theme Ideas, where will I find that? The Conference Store will have all the Annual Theme curriculum and products. In addition, be sure to check out the Art Gallery in the Covenant Fine Arts Center for fun room, table, bulletin board, photo booth, and theme night decor ideas. Contact hello@gemsgc.org to find out how you can serve during the Conference! Yes. Login information will be provided at check-in. Do you have medical assistance on-site? No, in case of emergency dial 911. Information for local clinics and hospitals can be found here. What is the Annual Theme and how can I learn more? The annual theme is LOVED. Period! That is what we are! It is based on 1 John 3:1, See what great love the Father has lavished on us, that we should be called children of God! And that is what we are! You can find out more information by visiting the Conference Store, attending the Saturday morning keynote message, visiting the Theme Idea resource room, or by attending any of the Theme related workshops. I’m not currently involved in a GEMS program, can I attend? YES! 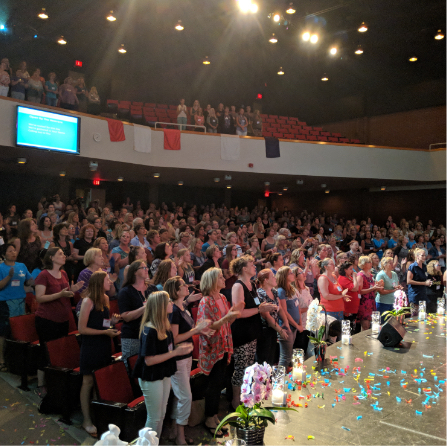 The GEMS Conference is open to all GEMS counselors, past GEMS counselors, or GEMS participants, and ANY woman who desires to be encouraged by a sisterhood of faith-filled women. If you want to learn more about walking alongside young girls, or, worship with and be encouraged by other women of faith then the GEMS Conference is the place for you! Click here to register. If you’re registering a group, you will want to obtain all their information prior to registering. Registration rates will increase on April 16 and June 16. Make sure you register before those dates to guarantee the best rates! To help keep everything organized and streamlined for this event, we are not offering a paper form of registration. Please contact our office at 616-241-5616 ext 2 OR hello@gemsgc.org if you are having difficulty registering online. We encourage you to take advantage of our early bird registration rate of $249 USD which will increase to $279 USD on April 16. Additionally, groups of 5 or more from the same club, who are registering for the FULL CONFERENCE during the early bird rate, are eligible for a Group Rate Discount of $224 USD. The group rate will increase to $249 USD on April 16. Rates will again increase for both individuals and groups on June 16 to $299 USD. Can I attend just a portion of the event? Yes, upon registering you can select the entire conference, or you can choose a single day option. Do we have to pre-select our workshop choices when we register online? Yes. It is suggested that you take time to read through the workshop options prior to registration, so that you and your team can attend different workshops and make the most of your learning opportunity. Select your top two workshop options from each session timeframe. Are on-site shuttles available around campus? Yes, golf carts will be available to transport women with limited walking abilities around campus. If I stay on campus what is provided in my guestroom? Great question! Each guestroom has two twin beds and shares a bathroom with another room. Towels, washcloth, a bar of soap, and a hand towel are provided. Sheets, a blanket, and a pillowcase with pillow are also provided.